Amid decades of decline in the manufacturing sector, Americans who once counted on those jobs to provide a stable income for a middle class life are slowly moving out of Rust Belt cities, in favor of the Sun Belt and the West Coast. New figures released by the U.S. Census Bureau show the nation’s fastest-growing cities are almost entirely in Sun Belt states, while the majority of cities that have seen their populations decline over the last five years are in five states that have borne the brunt of manufacturing’s decline. 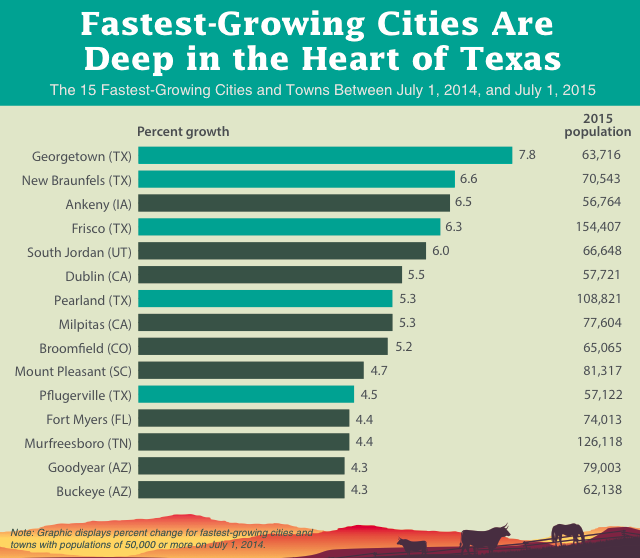 Five of the 15 fastest-growing cities in the last year are Texas suburbs, Census figures show. They include Georgetown, New Braunfels and Pflugerville, all suburbs of Austin; Frisco, outside Dallas; and Pearland, south of Houston. Four of the nation’s 11 largest cities are in Texas — Houston is the fourth-largest; San Antonio is seventh-largest; Dallas is the ninth-largest city; and Austin places 11th. All but one of the fastest-growing cities in America are in Sun Belt states like California, Arizona, South Carolina and Florida, or Mountain West states like Utah and Colorado. The lone exception is Ankeny, Iowa, where the population grew 6.5 percent over the last year, to 56,000 residents. All but one of the 15 cities that gained the most population overall are in the South and West. New York, which added 55,000 new residents over the past year, is the lone exception. The Sun Belt’s gain has been the Rust Belt’s loss. Of the 754 cities in the United States with populations greater than 50,000, 79 saw those populations shrink over the last five years; 45 of those shrinking cities are in Ohio, Indiana, Michigan, Illinois, Pennsylvania, New York and West Virginia. Detroit, one of America’s largest cities during the golden age of manufacturing, has lost almost 34,000 residents over the last five years, Census figures show. At an estimated 677,000 residents, Detroit is no longer among the nation’s 20 largest cities; Denver, which has added more than 79,000 residents in the past five years, has taken its place. Cleveland, which has seen its population shrink by almost 8,000 residents in the last five years, is no longer one of country’s 50 largest cities; it’s been replaced by Arlington, Texas. Those are only two of the manufacturing hubs across the industrial Midwest that have lost population as jobs move away. Figures from the U.S. Bureau of Labor Statistics show about two million manufacturing jobs have disappeared in the last decade. Other long-time manufacturing hubs across the Rust Belt are bleeding population, including Toledo, Ohio, Rockford, Ill., Flint, Mich., and Buffalo, N.Y. The population of Charleston, W.Va., has fallen below 50,000 for the first time since the 1920 Census. Population has also declined in a handful of cities struggling with crushing debt, including Montgomery, Ala., and St. Louis. The fastest-growing states are almost entirely void of shrinking cities: Just two cities in states that either border Mexico or face the Pacific Ocean have seen their populations decline in recent years — Delano, Calif., in the state’s parched Central Valley, and Wichita Falls, Texas, northwest of fast-growing Dallas. The Census Bureau data show seven new cities crossing the 100,000-resident threshold over the last year, including Renton, Wash., and Hillsboro, Ore., both cities where manufacturing hubs remain. Renton is home to a Boeing factory that produces the company’s 737 commercial jet; Hillsboro is home to Intel’s largest factory, which employs 17,500 Oregon residents. At 8.5 million residents, New York is still the nation’s largest city, by far. Los Angeles is home to almost 4 million residents. Chicago has 2.7 million people, and Houston is likely to cross the 2.3 million resident threshold this year. Philadelphia, Phoenix, San Antonio, San Diego, Dallas and San Jose, Calif., round out the top 10 largest cities in the country.